For the past few years, Colorado College’s State of the Rockies Project has been conducting a Conservation in the West poll, and the results continually show strong support for protecting the West’s environment. When voters in six states are asked about issues such as energy development, safety regulations, and public lands, they tend to prefer renewable technologies, keeping a close watch on business, and protecting open space for habitat and recreation. But there are some interesting regional differences, especially when it comes to energy. 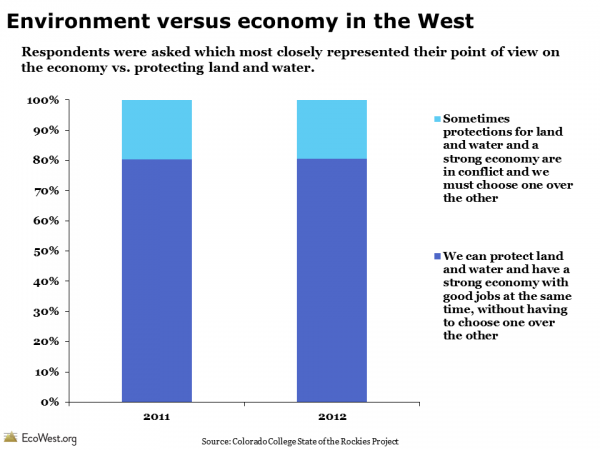 Annual poll of Western voters shows strong support for conservation from EcoWest on Vimeo. In an earlier post, we discussed the national-level results from Gallup’s polling on the environment. In some cases, Gallup has been asking the same question over and over, year after for year, for decades. Unfortunately, we haven’t found any comparable public opinion surveys of the West that offer such a lengthy time series. Some states in the region have longstanding surveys, such as California’s Field Poll, which was established in 1947. 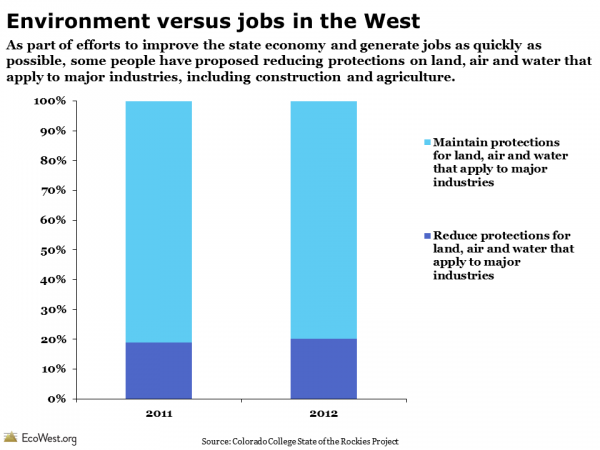 The Public Policy Institute of California also puts out a yearly poll on the environment. Nine in ten people polled said that national parks, forests, monuments and wildlife preserves are essential to the economy. 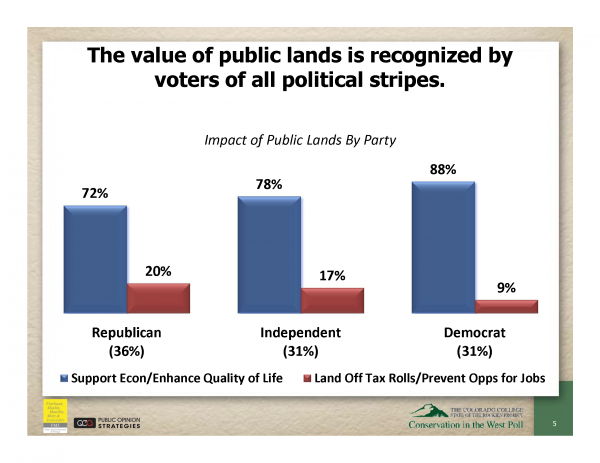 Three in four said that those lands furnish good jobs, and more than seven in 10 said that no public lands should be sold to private corporations. Three in five said that drilling should not be allowed in “critical locations” near recreation areas, water sources or wildlife. Only 35 percent said that more public lands should be opened to “responsible energy development. In tandem with two pollsters (Lori Weigel of Public Opinion Strategies and Dave Metz of Fairbank, Maslin, Maullin, Metz & Associates), Colorado College conducted a survey of 2,400 voters in six Western states: Arizona, Colorado, Montana, New Mexico, Utah and Wyoming. Environment vs. economy: false dichotomy? Although we hear a lot about the environment versus the economy, nearly 80 percent of respondents said we can simultaneously protect land and water while maintaining a strong economy. Below are the results from a similar question, which asked respondents whether they favored “reducing protections on land, air, and water” that apply to businesses in order to help the economy and generate jobs as quickly as possible. Fewer than one-fifth of Westerners supported that proposition. Regardless of political affiliation, the vast majority of Westerners believe that public lands support the economy and enhance the region’s quality of life, rather than “take land off the tax rolls, cost government to maintain them, and prevent opportunities for logging and oil and gas production that could provide jobs,” as shown in graphic below. 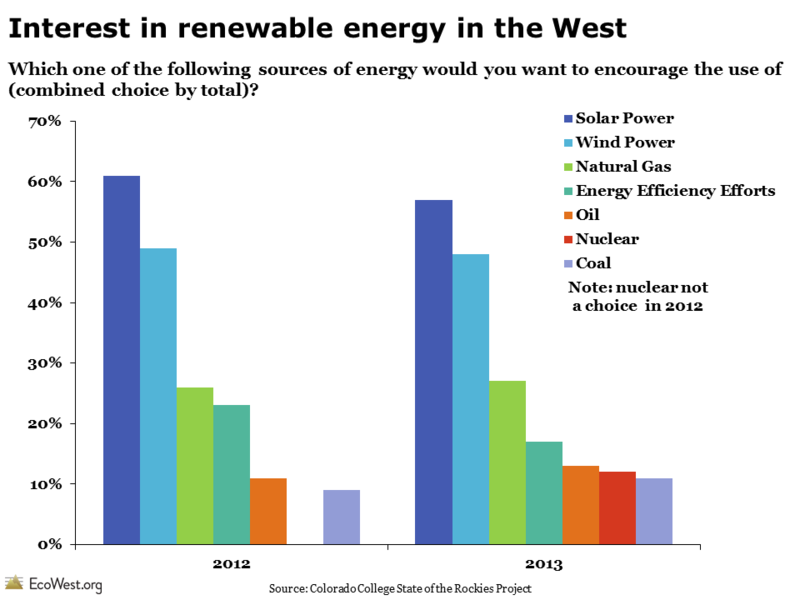 Many of the questions in the past three years of polling have related to energy. 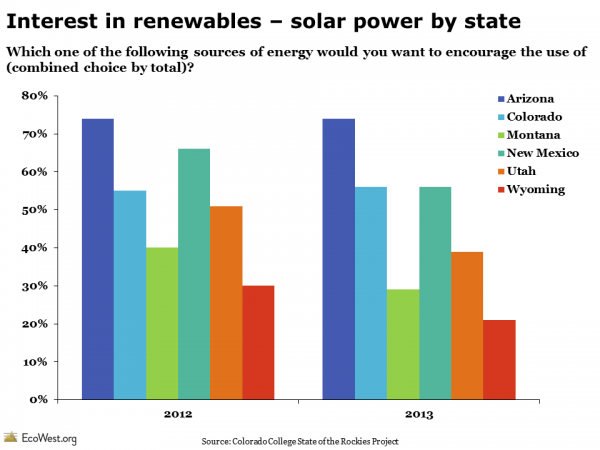 When asked which energy sources they’d like to encourage, solar and wind power come out on top and coal is at the bottom. Of the fossil fuels, Westerners favor natural gas, even rating it above energy efficiency efforts. The results are similar when people are asked about what energy sources they’d like to discourage. 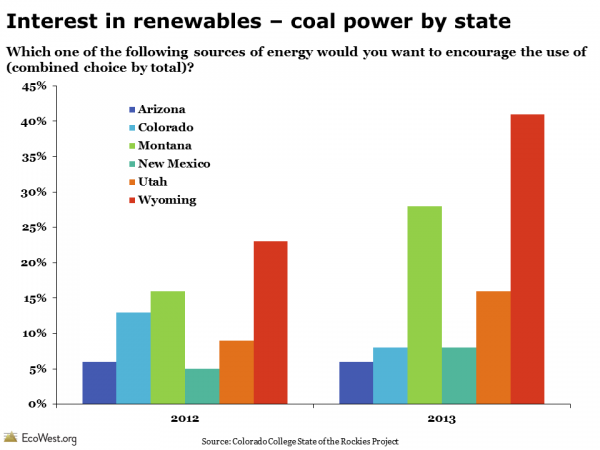 When asked about encouraging coal as an energy source, Wyoming stands out. No surprise there: it’s the largest coal-producing state in the country. There was also a large jump in support for coal from 2012 to 2013 in Wyoming, Montana, and Utah, but a decrease in support in Colorado. Perhaps the growing support for coal in some states is a backlash against increasing federal regulation of the fuel source. Hopefully, the State of the Rockies project will continue to commission this poll so that we can keep tracking changes in Western public opinion in the years to come. If you find other surveys on Western environmental issues, please let us know. You can download data from the 2013 poll, a presentation summarizing the results, and state-level reports on this page. Results from 2011 and 2012 are also available. Thanks to Micah Day for assistance with this post. Gallup has been polling Americans on the environment for decades and it’s one of the best sources I’ve found for tracking long-term trends in public opinion on conservation issues. Something that struck me while analyzing this data is an apparent increase in hostility toward the environmental movement over the past decade or so. 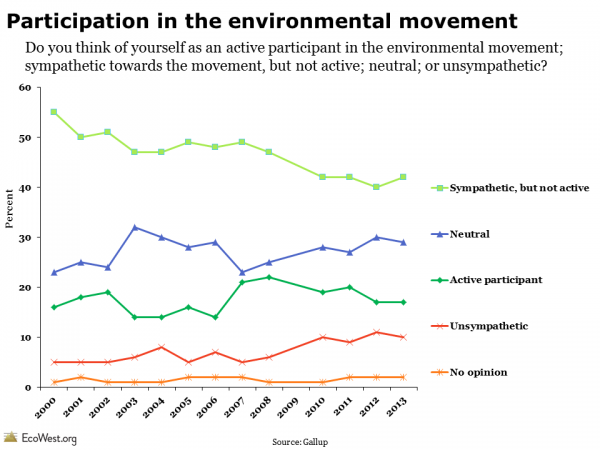 The graphic below from our politics deck shows trends in participation in the environmental movement from 2000 to 2013 (Gallup apparently skipped the question in 2009). Most Americans say they’re concerned about environmental issues, but fewer than one in five consider themselves active participants in the movement. Since 2008, that figure has fallen from 22 percent to 17 percent. 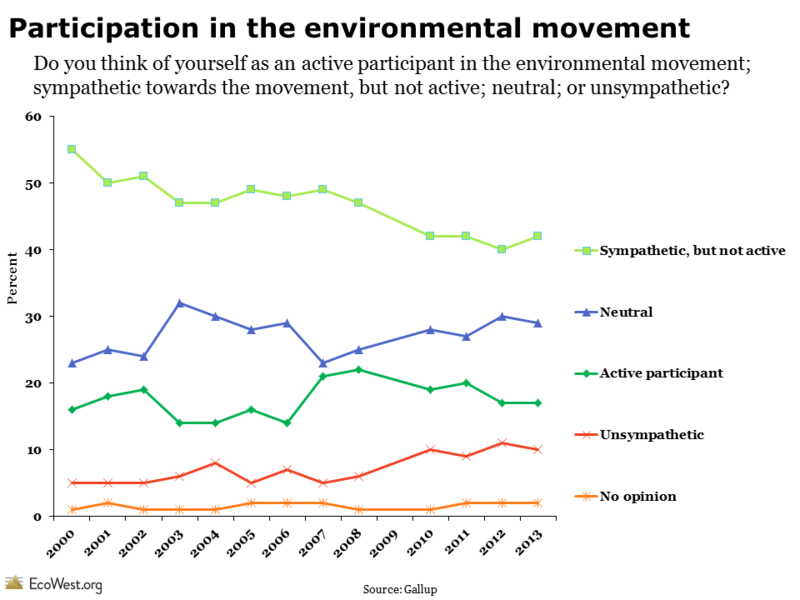 About two-fifths of Americans consider themselves sympathetic to the movement but not active, but the percentage of people saying they were “unsympathetic” has doubled since the early 2000s, from about 5 percent to 10 percent. If you add the active participants (17 percent) and sympathizers (42 percent), you reach 59 percent, a healthy majority of Americans, but that’s down from 71 percent in 2000. Similarly, if you add the unsympathetic and neutral view points, it sums to 39 percent today, up from 28 percent in 2000. Another survey question, which Gallup last asked in 2010, also suggests there is some rising animosity toward environmentalists. The percentage of Americans saying the movement has definitely or probably done more harm than good rose from 14 percent in 1992 to 36 percent in 2010. Conversely, the fraction of Americans who said the movement had definitely or probably done more good than harm decreased from 76 percent in 1992 to 62 percent in 2010. I don’t want to make too much out of these survey findings. The jump in unsympathetic Americans from 5 to 10 percent over 13 years isn’t exactly a groundswell of opposition to the environmental movement. But if I were a leader of an environmental NGO, this public opinion data would be troubling. Why is there increasing negativity toward environmentalists? Other polling results we’ve examined show that support for environmental protections ebbed a bit during the Great Recession, so it would seem to follow that impressions of the movement would also take a hit during tough economic times. In recent years, conservative politicians, opinion leaders, and interest groups have launched a barrage of attacks and negative advertising against environmentalists, so that may be a factor as well. What do you think? 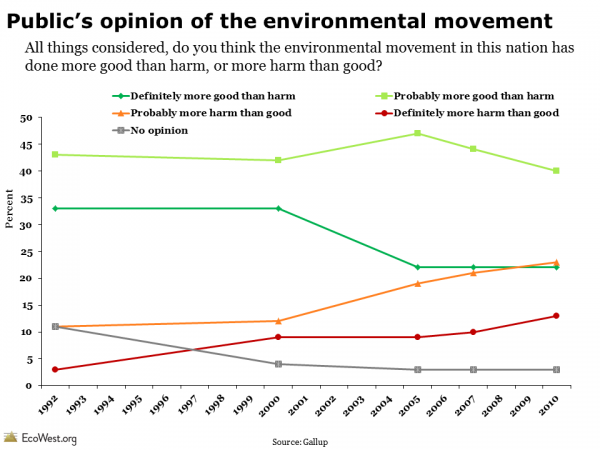 Are there other reasons why more Americans view the environmental movement in a negative light? Results from Gallup’s environmental polling are summarized on this page and contained in our politics deck, which also has data from other environmental polls.